This table is made from a beautyfully rare African hardwood 'Zebrano' and this design has a stylish and convenient hotplate as centre piece. As with all 'Redhouse' designs the pieces are made to order and could then be made to any possible size and dimensions, hence this design could be made into a coffeetable or modified into a desk. 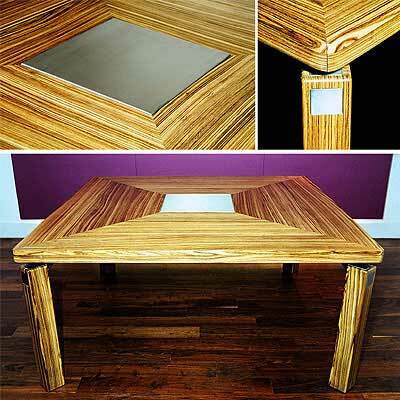 This table can also be constructed using other tropical hardwoods, a darker alternative would be 'Wenge'. This table is designed so that it is easy to dismantle to make it easier to transport which is useful when ordering a large table. Any size, any solid wood or wood veneer can be used so call for your quote today?